Frustrated with always having to do your own dry cleaning, ironing, laundry or Alterations & Repairs? Let the experts at Davis Professional Dry Cleaing make life so much easier for you! Based in Chatham, we offer homeowners and commercial clients a truly one-stop shop for all laundry, dry cleaning and tailoring needs. We offer a state-of-the-art dry cleaning facility, experienced members of our team and a level of service you won’t find anywhere else. Call us on 01634 864008 or visit us in our Davis Estate shop in Chatham to discuss your dry cleaning requirements or even drop off your dirty laundry for us to dry clean for you today! We are open 6 days a week to enable us to cater for all dry cleaning, ironing and laundry needs. We are closed on bank holidays. Our free delivery and collection service works 9am - 9pm. We offer free delivery and collection for all dry cleaning that comes to over £25. We will collect your dirty clothes, curtains and any other lines or fabrics at a time that suits you and, once cleaned, drop them off at your convenience. We provide this service for anyone living within a 3 mile radius of our shop. Please call us on 01634 864008 for more information. We can collect and deliver from any where but there is a change in the minimum charge so please call to get information. We don’t like to over-charge our customers, which is why you will find our dry cleaning, laundry and ironing prices to be very fair and reasonable. For instance, our shirt dry cleaning service costs just £4.10, trousers cost £4.50 and curtains cost £9.30 per kilo. As a family run business, we put our customers first. We take great care with every item we dry clean, iron or wash and we have developed a reputation for high quality customer service, competitive prices and a dedication to professional dry cleaning that is unrivalled. Based in Chatham, Kent, we provide the highest quality dry cleaning, laundry and ironing services to private, domestic and commercial clients from throughout the whole of Kent. Providing a free delivery and collection service to clients within a 10 mile radius,(min spends required). 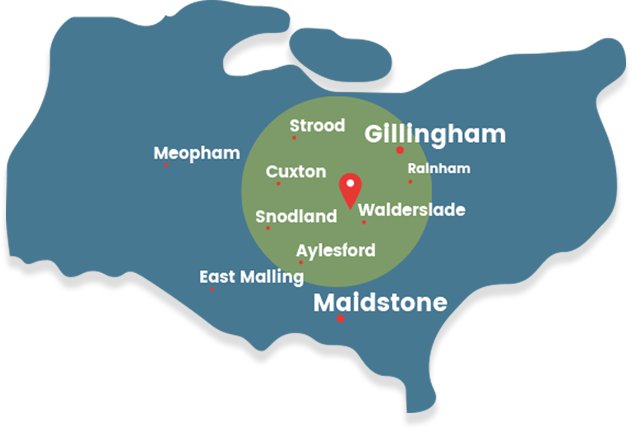 We regularly deal with clients in Sittingbourne, Sheppey, Medway, Chatham, Rainham, Rochester, Stood, Gillingham, Hartlip, Walderslade, Hempstead, Upchurch, Cliffe, Cuxton, Snodland and St Mary Island. Of course, customers are always welcome to come and visit us in-store and we regularly have clients coming from as far away as Maidstone, Lenham, Bearsted, Aylesford, Sevenoaks, Canterbury, Faversham, Tunbridge Wells, Tonbridge, Ashford, Gravesend, West Kingsdown, West Malling, Kings Hill area. We can collect and deliver from these areas as well at a min spend. If you would like any more information, please do not hesitate to contact one of our friendly team today. We will answer any questions and discuss your dry cleaning requirements.